The Queen and The Duke of Edinburgh opened the new Mary Tealby dog kennels at Battersea Dogs and Cats Home, London. For more: YouTube video, ITV article and video, Zimbio gallery. 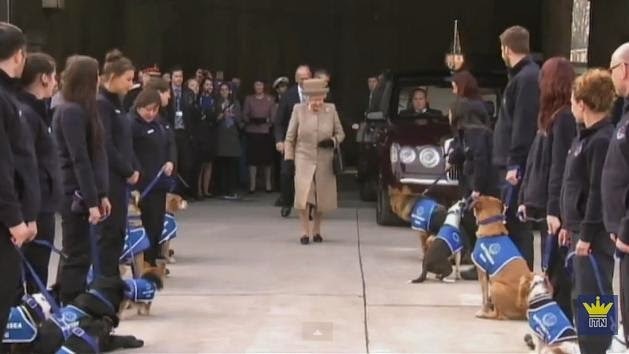 So, the Battersea Home put on a canine guard of honor for Her Maj's visit today. A CANINE GUARD OF HONOR, GUYS. Well, I'd wager this has already made the list for her personal favorite engagements of the year. The Queen also held audiences at Buckingham Palace. This looks like the Cullinan V. Hard to see as always, but I'll go with that.